Most (if not all) writers have problems with using punctuation effectively, especially commas. But, arguably, the most misunderstood piece of punctuation is the semicolon (;). The semicolon can be used in two different ways: to connect two ideas and to separate items in a list. The second usage, while not quite as common, is easier to understand, so let’s start there. While packing for the trip, we made sure to bring beach chairs, two kites, and a beach ball. While packing for the trip, we made sure to bring beach chairs, one for each person; a dragon kite and a bumblebee kite; and an extra-large beach ball. Four groups of interest are highlighted: G1, ancestral sequences that have almost been completely lost from the human lineage; G2, ancestral sequences that are largely fixed but rarely deleted (also absent in human reference); G3, ancestral sequences that have become copy-number variable since the divergence of humans and Neanderthals/Denisovans ~700 ka; and G4, sequences potentially lost in Neanderthals and Denisovans since their divergence from humans. Some people write with a word processor; however, there are still people who choose to write with a pen or pencil. I’ll also adjust the first two sentences of our sample Science text to show you how this pattern might look in a STEM piece. In the past decade, genome sequencing has provided insights into demography and migration patterns of human populations, ancient DNA, de novo mutation rates, and the relative deleteriousness and frequency of coding mutations; however, global human diversity has only been partially sampled and the genetic architecture of many populations remains uncharacterized. In the WRC, I usually see semicolons (when used correctly) paired with “however.” This may be because “however” on its own establishes a relationship between the original idea and the one that is about to be contrasted to the original, making it a bit easier to understand why and how a semicolon works in that situation. Of course, if you find that you’re not comfortable with or confident about using semicolons, then don’t! While I may be the #1 Fan of the semicolon, it doesn’t mean that everyone has to like and use them (even though they’re super fabulous…). If you do want to use semicolons in your writing, I suggest you start out with using no more than one per paragraph (if that). Once you’ve become comfortable with using them, run free! 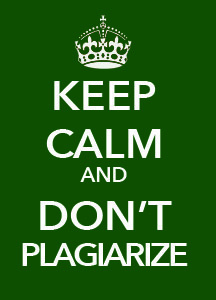 Paraphrasing, Quoting, and Citations: Why is Plagiarism Such an Issue? Academic integrity is a huge topic at universities. Many times, academic integrity violations can have serious consequence, sometimes even expulsion from the university, so it’s taken pretty seriously (See our own academic integrity policies at legal.uncc.edu/policies/up-407). Citation can be a tricky process, especially when you’re first learning. Don’t worry, the WRC is here to help; we’ve got lots of practice with proper citations. But why does academia care so much? I guess the first thing we need to talk about is the fact that in the United States, we follow what is called the Western definition of academic integrity. This idea is built around ownership of ideas, something that is very important in individualistic, capitalist cultures. If you own an idea, you can take credit for it, win awards for it, and make money off it, so Westerners tend to be very concerned with assigning proper ownership. This can be new if you’re an international student and used to another definition of academic integrity. In different cultures, the definition of academic integrity can change; this isn’t bad, it’s just different. When you immerse yourself in an academic culture, you will be judged by that culture’s standard. Bottom line: if you’re studying in the US, you need to follow the standards developed by Western academic integrity and defined by your university. UNC Chapel Hill has a great handout on plagiarism, found here: http://writingcenter.unc.edu/handouts/plagiarism/. Ownership of ideas is the key phrase in that last paragraph to illustrate why universities take such a hard stance on plagiarism. But there are other reasons, perhaps better reasons, why we cite our sources so well. We cite others both to give them ownership of their ideas and to show our original work. Simply put, we’re giving credit where credit’s due. Another reason we cite is to show readers the path we took to get to our conclusions. This allows readers to see that we’ve done the proper background research, that our conclusions are sound, and that we’ve actually thought about what we’ve written, fitting our new information or conclusions in with current knowledge. A great benefit of proper citations is that it creates authority for you. The reader can see that you take your work seriously. Drawing out this path for readers also allows them to take the same path. They can pursue more information or try to recreate your research to discover new things for themselves. Overall, citations are not there to make your life hard. They’re there to help you, the people who are reading you, and the people you read. However, citation practices may vary across disciplines. It’s a good idea to find an authority in your field and ask them about proper citation practices so that you can be a fully contributing member of your discourse community. If you have questions about paraphrasing, directly quoting, and citing, please, come in and see us. We’d love to help. The librarians at Atkins are also here to help as well. Check out the UNC Charlotte Library Citation Guides (http://guides.library.uncc.edu/CitationGuides) and their Citation Workshop calendar for upcoming events.